Voor een cd met restjes van de plank veer ik maar zelden enthousiast op, maar hoe zit dat wanneer deze restjes afkomstig zijn van één van de betere en bovendien één van de meest succesvolle songwriters van de afgelopen decennia? Stevie Nicks, want daar heb ik het over, trok aan het eind van de jaren 60 voor het eerst aandacht als zangeres van de band Fritz, die ze samen met haar studiegenoot Lindsey Buckingham had geformeerd. Een paar jaar later waren Nicks en Buckingham niet alleen een stel, maar had het duo als Buckingham Nicks ook een plaat vol geweldige popliedjes opgeleverd. De plaat flopte genadeloos, maar het tweetal werd wel uitgenodigd om het op dat moment meer dood dan levende Fleetwood Mac te reanimeren. De rest is geschiedenis. Stevie Nicks had niet alleen een groot aandeel in het succes van Fleetwood Mac, maar maakte de afgelopen decennia ook een groot aantal soloplaten van hoog niveau, met het in 1981 verschenen debuut Bella Donna als hoogtepunt en het in 2011 verschenen en eveneens uitstekende In Your Dreams als voorlopig slotakkoord. 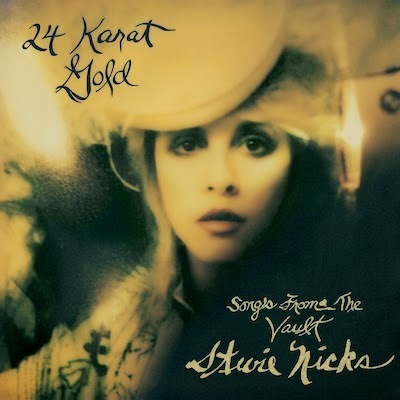 24 Karat Gold - Songs From The Vault bevat, zoals het tweede deel van de titel al aangeeft, songs die Stevie Nicks nog op de plank had liggen. Het ging in de meeste gevallen om ruwe demo’s, die het afgelopen jaar verder zijn uitgewerkt en opnieuw zijn opgenomen. Stevie Nicks heeft haar archieven kennelijk goed op orde, want de oudste songs stammen uit de periode voor Buckingham Nicks, toen Stevie de highschool nog maar nauwelijks was ontgroeid. 24 Karat Gold - Songs From The Vault geeft, met in ieder geval voor mij nieuwe songs, een mooi overzicht van de lange carrière van Stevie Nicks en bevat songs uit alle onderdelen van haar zo succesvolle carrière. De plaat bevat 14 tracks (twee extra op de luxe editie) en het zijn allemaal tracks die het uit duizenden herkenbare Stevie Nicks geluid laten horen. Het is een geluid dat voor een belangrijk deel wordt bepaald door haar mooie en bijzondere stem en dat hiernaast opvalt door het vermogen van Stevie Nick om schaamteloos aanstekelijke maar tegelijkertijd artistiek verantwoorde popsongs te schrijven. Het is ook een geluid dat in de loop der tijd niet heel erg is veranderd, want ondanks het feit dat de songs op 24 Karat Gold een periode van zo’n 45 jaar beslaan, klinkt alles als 100% Stevie Nicks en zou het net zo goed kunnen gaan om een vergeten reissue als om een gloednieuwe plaat. Belangrijkste vraag is nu natuurlijk of het eerste deel van de titel van de plaat recht doet aan de songs die de plaat uiteindelijk wisten te halen of dat restjes op de plank niet voor niets op de plank zijn blijven liggen. Ik neig naar het eerste. 24 Karat Gold is natuurlijk een hopeloos pretentieuze titel voor een selectie songs die de afgelopen decennia niet goed genoeg werden bevonden voor een release, maar op de kwaliteit van de songs op de plaat valt niets af te dingen. Ik kende op voorhand geen van de songs op de plaat, maar na één keer horen klonken ze alle veertien niet alleen vertrouwd, maar ook bijzonder aangenaam. 24 Karat Gold - Songs From The Vault bevat misschien restjes, maar het is uiteindelijk een plaat die niet onder doet voor alle andere platen van Stevie Nicks en die zijn zonder uitzondering goed. Het levert al met al een heerlijke plaat op met 'nieuw' Stevie Nicks materiaal. Zeer de moeite waard. Landmark 105 was the room Janis Joplin stayed and died in. This gives a hint as in what direction the music of Landmark 105 is to be found at. Not that the music ever gets as raw and openly emotional as with Ms. Joplin. For that Liesbet Kwantes Scholte's voice is too kind. It does have a nice rough edge though, that lends several songs on This time an edge of authenticity. Lifting the album right beyond the mediocre into those pleasant spheres Americana or West Coast the Eagles rock can lift one in. For me this sort of music is a thin line and it's not easy for an artist in this genre to stay on that line and not to fall off. Landmark 105's balancing act is a nice one to follow. Not that the album scores a 100% (hardly any album does that), but several songs surely come close. Let me start there. In the songs that Liesbet seems to give just this little more, the songs come alive and sparkle. When the instruments follow her cues. That is when This time really gets interesting. 'You should have' is a fine specimen. Heartache, being left behind, infidelity?. The pain and hurt slip into her voice which gets that extra edge, a little hardness. The mood is caught by Aldo Spadaro's guitar, who's sliding away and Kirsten Boersma's warm sounding organ that appears to envelop Scholte in comforting sounds. 'Good for nothing' is a song that echoes the country-rock side of the Rolling Stones or the Faces (or the Black Crowes of course). 'Good for nothing' rocks out. I can't help wondering how Beth Wimmer would sound with this song. It won't rock in her version though. A few times I'm reminded of Anouk as well. Especially in 'I'll be fine'. This time grows better as it develops. So many albums are the opposite. The band is in balance. Its foundation, Fabian Kraal on drums and Tom van Loon on bass, is solid without over-doing it. They allow the others to lay down their contributions while keeping the band going in the softer songs and when rocking out. The best song on This time is the final song, 'Better day', a rocker that I think Janis Joplin wouldn't have minded adding to 'Pearl'. Liesbet Kwantes Scholte sounds like she's been singing all day to get the sound right. That moment when singing starts to hurt a little, the voice a bit hoarse. Like Beth Hart sounds when she gets out of bed and still has to start singing. The band really lets it go in return and together they create a fine, fine 'Better day'. Not all the songs on This time are as good as this. Some go into an other direction. Ready to be sung in church almost and the album loses its pace, e.g. 'Middle name'. At the start of the album there's a lot of promise. 'Follow the sun' rocks in a modest way. The brakes are on though, a lot of self-restraint is in place. A nice song though showing what Landmark 105 is capable of. The single would not have been my choice. 'Start again' has a lot of stops and starts and some country twangs and overtones. Too Ilse de Lange to my taste, where Landmark 105 is able to do more and rock a bit less homey as it shows on the rest of This time. A safe choice, but not representative of what the band does in general. 'Lose your head' is also country, but a song with a lot of nastiness, dirt roads, gravel and possibly alligators round every bend. 'Lose your head' is dangerous. And so much fun to listen to. 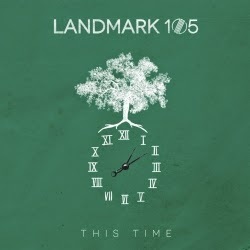 Landmark 105 has come up with a debut album that certainly sits on my right side. The band shows several faces of which most appeal to me. Some do not, but I can live with the end result easily and I'm certainly interested to find out what happens live when the band might really start playing. Wo. continues his exploration of the albums behind the hits of his early youth. One of these number one hits in the spring of 1969 was Scottish singer/songwriter Donovan Leitch's only number 1 hit in The Netherlands: 'Atlantis'. Although 'Hurdy gurdy man' was a hit in the late summer and fall of 1968, it is this song by Donovan that defines the singer in Wo's opinion. Another pop symphony, mysterious and overwhelming. Hence the choice for the underlying album. Preceding Donovan were albums by e.g. Joe Cocker, Barry Ryan, Blood, Sweat & Tears, etc. Barabajagal is also the title of a single by Donovan & the Jeff Beck Group, released later in 1969. I faintly remember a sort of funky song, that I definitely did not really get at the age of 9. (And still don't, so my ears did not deceive me then.) It also did not become a large hit and disappeared from memory fairly some after, although I could always remember the central form of the song, chorus is too much honour,as it's more like a chant than chorus. 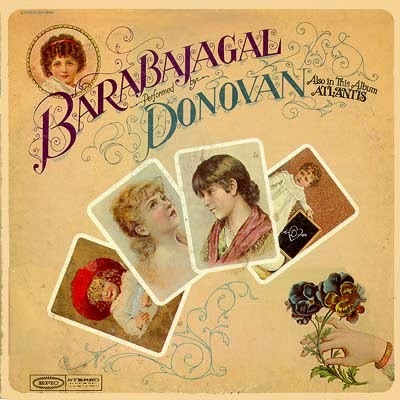 'Barabajagal' was also the last hit by Donovan in NL, with one exception in 1974. Having been in the charts continuously since 1965 and with finally a number 1 in 1969, something must have happened. Reading up on the album, I found out that Donovan stopped the cooperation with his producer Mickey Most soon after the recording sessions for Barabajagal. Or was it the other way around? Most objected to Donovan's work ethics. An important question here is, who was responsible most for the charting successes, the artist or the producer? Interesting, isn't it? Having never heard a Donovan album before, just the hitsingles and I have a compilation from the late 80s or early 90s with some live tacks as well. So there are some surprises on this album or better, it's the diversity of Barabajagal that surprised me. All aspects of Donovan come by with the Jeff Beck collaboration as extra. There are some electric bluesrock songs and the typical Donovan folk with which he broke through in 1965, following Bob Dylan's cues. Switching from acoustic to electric, where Donovan certainly was also interested in flower power and psychedelia. Most of these sides come back on this album. Where this diversity is concerned is also where I run into difficulty with Donovan. The plain silliness of 'I love my shirt' is plain supercilious. Man, do I hate this stupidity in sound. The soft, acoustic Donovan also is not my favourite, but certainly is alright to listen to. The mix of Barabajagal saves me from Donovan and Donovan from me switching him off. The start of the album is mixed. After the title song, the 'Sunshine Superman' like rocker 'Superlungs my Supergirl', the song was originally recorded for that album, but shelved, rocks loud, while at the same time has an arrangement that takes it away from rock. Set off against the loud distorted guitar, a strange mix comes together making 'Superlungs my Supergirl' one of the favorites of this album. 'Where is she' starts as if Frank Sinatra is about to sing. "Breathy singing" this style is called. Let me stop my comments here. 'Happiness runs' is something of a children's song. Graham Nash can be heard as can Michael McCartney and Madeleine Bell in the rounds that go around and around. 'Happiness' works by the way, one of those songs that make this album successfully diverse. A song like 'The love song', the title as dangerous as 'I love my shirt', has urgency. The piano gives the song urgency as do the high end vocals. 'The love song' has something modern, despite being recorded closing up on a half century ago. 'To Susan on the West Coast waiting' is Donovan's take on a protest song. Personalised as he's good at. Looked at from the perspective of a personal relationship between boy and girl. The only hint at protest is in one sentence: "Our fathers have painfully lost their way, that is ... why I'm here today". For the rest it is Donovan's small and lovely sound. For the rest Andy could have been at college on the East Coast or holiday, wondering if Susan really loves him. Not that I really like the song, but it is done quite well. Fitting in with many a song from the era and still so different. And finally I get to the song that this is all about: 'Atlantis'. This song is build up brilliantly. The lyrics is on the legend of Atlantis, the fabled island/continent that disappeared into the ocean. Sing-song introduces the theme with an acoustic guitar and sparse piano notes, before the song takes this immense twist into an epic chorus/chant. The lyrics switches to the personal, the singer looking for a love that may be under the ocean, that's where he wants to be. How many hits have the word "antediluvian" in them? A chorus that stops precisely at that moment that I preferably could get lost in it forever. That sort of chorus. The piano does what Abba would become great at in the 70s. A blues guitar rocks out. Donovan comes up with more different snippets of text and counter vocal melodies in different parts of the mix. No doubt, this is his best song, outshining everything else he has done. 'Trudi' is the second song with the Jeff Beck Group that Donvan and Most made for this album. To drop a few names. Rod Stewart was in the Group, Ronnie Wood, Nicky Hopkins, to name a few. In other words, Donovan was working with a few guys who were to make it really big very soon. 'Trudi', is the other odd one out on Barabajagal. Backed by Jeff Beck and group Donovan's songs were really different in sound from what he usually recorded. 'Pamela Joe' ends the original album. A bit of a ditty, this song is, but a nice one. A bit vaudeville, a bit of a joke. you can hear that in parts of Donovan's singing. In short Barabajagal is an album that I listened to with mixed emotions. Perhaps to diverse and with the Jeff Beck Group sessions sticking out like a sore thumb. Not bad, far from, but not fitting the artist Donovan was at the time. A few song give me itches in the strangest places and some I truly like and then there's 'Atlantis'. I will never stop liking this song. In de lente van 1996 werd ik smoorverliefd op de muziek van de Zweedse singer-songwriter Sophie Zelmani. Het debuut van Sophie Zelmani was een sprankelende en zonnige singer-songwriter plaat vol onweerstaanbare popliedjes. Popliedjes zoals Van Morrison die maakt maar dan met lieflijke vocalen en alleen maar zonnestralen. Sophie Zelmani’s buitengewoon charmante accent deed in combinatie met haar zwoele fluisterstem de rest. Twee jaar later verscheen de tweede plaat van Sophie Zelmani en hierop had de aangename lentezon plaats gemaakt voor donkere wolken. Precious Burden was een uiterst sombere plaat, maar het was ook een wonderschone plaat die mijn liefde voor de muziek van Sophie Zelmani alleen maar groter maakte. Na Precious Burden maakte Sophie Zelmani nog een aantal platen. Het waren zeker geen slechte platen, maar de magie van het zonnige debuut en de zo sombere opvolger ontbrak. Na het wederom aardige maar niet opzienbarende The Ocean And Me verloor ik Sophie Zelmani uit het oog, tot een lezer van deze BLOG me een aantal dagen geleden wees op een nieuwe plaat van de Zweedse singer-songwriter. Going Home blijkt één van twee nieuwe Sophie Zelmani platen die eerder dit jaar verschenen. Ik begon met enige zorg aan de beluistering van de nieuwe platen van de Zweedse singer-songwriter, want hoe groot is de kans dat ze me na al die jaren net zo zou raken als in de lente van 1996 of de herfst van 1998? Laat ik beginnen met Going Home. Going Home bevat maar één nieuwe song en verder nieuw opgenomen versies van songs van de eerdere platen van Sophie Zelmani. Natuurlijk ging ik direct op zoek naar de songs van de platen die me zo dierbaar zijn, maar beiden zijn slechts met één song vertegenwoordigd. Dat is aan de ene kant jammer, maar aan de andere kant kan Sophie Zelmani niet veel toevoegen aan songs die ik al meer dan 15 jaar koester. Ze voegt daarentegen een hoop toe aan de songs die ik niet of minder goed ken. Al deze songs zijn voorzien van een buitengewoon stemmige instrumentatie bestaande uit voornamelijk piano en akoestische gitaar, hier en daar wat verder ingekleurd met strijkers en een aantal andere instrumenten. Het is een instrumentatie die me herinnert aan Precious Burden en dit wordt alleen maar versterkt wanneer Sophie Zelmani begint te zingen. Aan haar accent is niets veranderd en ook haar stem klinkt nog vrijwel hetzelfde als in de lente van 1996 of de herfst van 1998. Het wist me direct te betoveren en sindsdien is Going Home eigenlijk alleen maar mooier en indringender geworden. 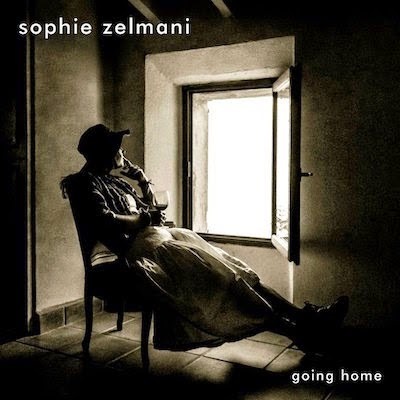 Songs die op de latere platen van Sophie Zelmani verbleekten door een te volle productie of een slecht gekozen instrumentatie komen op Going Home tot leven en maken vrijwel zonder uitzondering een verpletterende indruk, ook wanneer de sombere klanken opeens worden afgewisseld met behoorlijk uitbundige gitaren. In 2012 the first album (http://wonomagazine.blogspot.nl/2012/05/flying-colors-flying-colors.html) by this super group made it to my favourites of the year. Quite surprising actually as prog rock is not my thing; with a few notable exceptions. Second nature was on my to listen to list for a few weeks already, but somehow did not get to the top. Tonight it did and boy am I glad that I put it on, finally. To write that it blows me away is exaggerating but only slightly. It does match the storm I woke up with this morning for sure. My first impression, and at this point into the review I'm listening for the very first time to Second nature, is that this a varied album. Extremely powerful and played by a band which is not afraid to do something different. There's even a Led Zeppelin like folk song with an accordion in the set. I can echo myself somewhat as Second nature sounds so fabulously good. 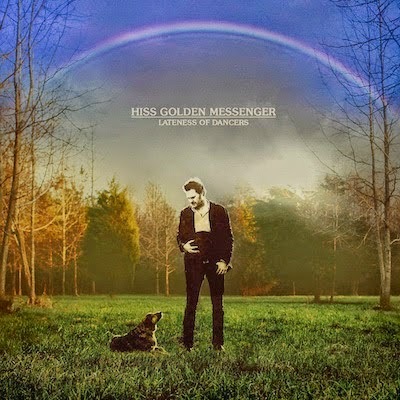 The album has a warm, full sound, to totally submerge into. There's a lot going on at all times and again Flying Colors presents its listeners with a high mass of symphonic rock of the past, now, 44 years. This band knows exactly what it's playing and can echo famous sounds of the past as easily as create a few of its own. 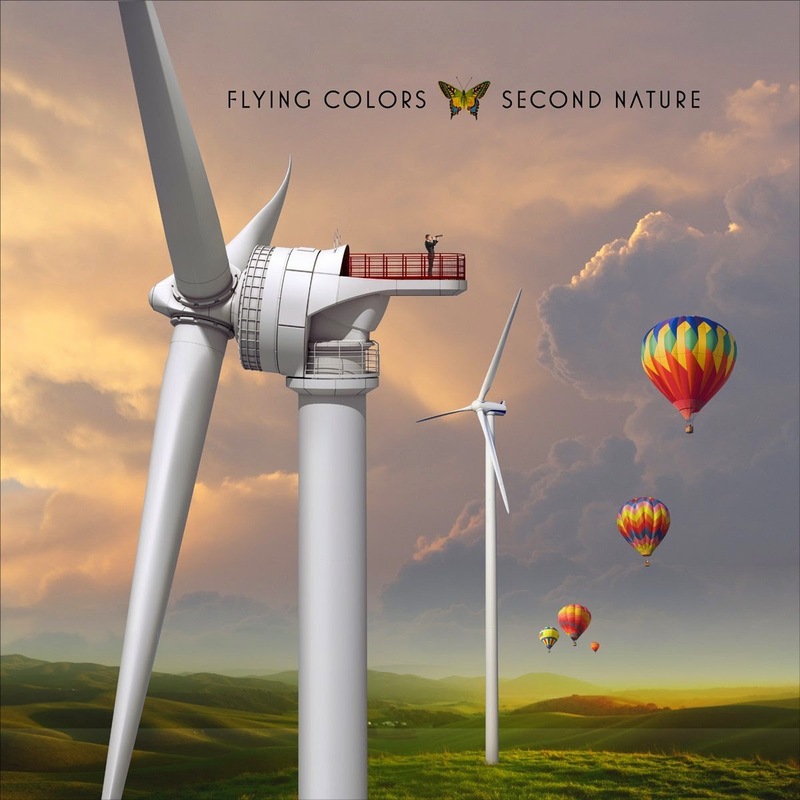 Flying Colors is a band filled with veterans of the second and third prog generation that know their way around in this music, like it's their backyard. Although that slick lead guitar solos are all over the place, most other things compensate more than enough for me. The album starts with just a piano part. Small for Flying Colors, when the guitar starts copying the piano part things shift and some good old jazzrock parts come by. U.K. (Bill Bruford on drums), King Crimson (at times with Bruford as well) and Yes (again in the early incarnation with Bruford as well) all come by. Not that Second nature is a Bill Bruford tribute album, for that too many other things go on (melodically), but some of these complex rhythms I only know from that guy. Jazzrock never was my thing. Too complex and a-melodic for me. The almost 13 minutes 'Open up your eyes' holds it all. A near brilliant combination of complex rhythmic acrobatics and melodic parts, with a centre spot for guitars and keyboards. Some nice bass runs and the drums mixed straight in the middle. Over all that the singing of Casey McPherson with his very pleasant sound, backed up here and there by some great harmonies. Behind a song can go of in any direction. McPherson doesn't care. He brings it all back into the fold a soon as he starts singing. Flying Colors manages to be much more direct also. 'Mask machine' the album's first single is a crass rocker with distinct Queen influences. Steve Morse manages to send a telegram through a 1000 notes per second Morse code. One of those forceful solos Second nature holds, next to tight rhythm playing and some wild riffing. There's so much going on. I'm holding on to my ears half of the time listening to the album. 'Bombs away' does the same trick. Strong rock with some higher singing. It is a song like 'Bombs away' that make me like Flying Colors better. Rock, some hints at prog and a good melody. It's the mix that works for me. The mix of styles on this album is attractive also. 'The fury of my love' could sort of have been sung by Frank Sinatra, like it is easy to imagine Steven Tyler putting on his fog horn. McPherson does not have that much power in his voice, but a lot more pureness and ease. 'The fury of my love' is a ballad like they used to make in the 80s. The shortest song on Second nature is 4,40 minutes long. ' Lost without you' is another ballad, but with some more guitars and stronger drumming with nice rhythmic side steps, taking the song steps forward with each small adventure. The Celtic sidestep is called 'One love forever'. The least successful experiment in my opinion. It just doesn't blend with the rest of the album. The last two songs on the album almost take 20 minutes. 'Peaceful harbor'. Another ballad that starts very soft, but ends like a Pink Floyd song, sound, backing vocals and all. 'Cosmic symphony' is another long song built up out of three parts. Slowly the song gets a more threatening undertone working towards a climax, that is short lived. In fact it gets more subtle after the extremely short release. A little jazzy even with a nice electric piano. Again violins come in, before Steve Morse goes off on another great guitar solo. 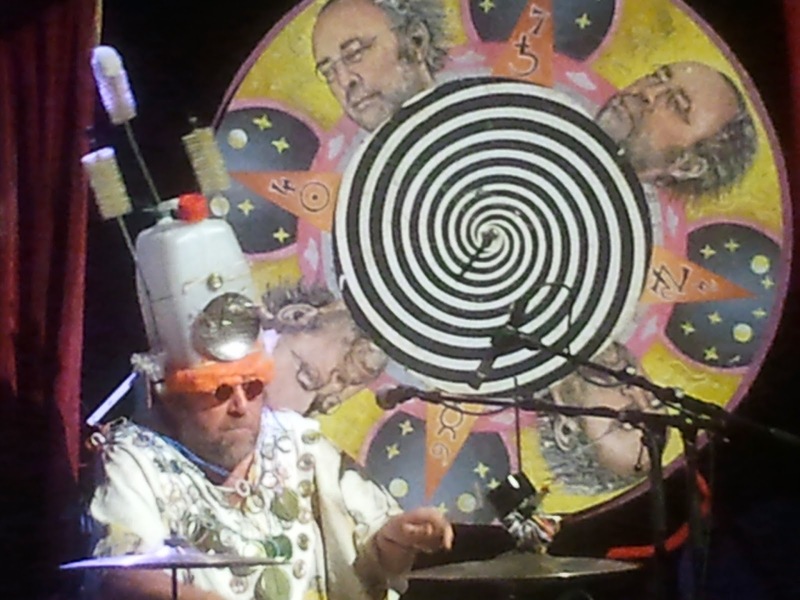 The strong point of 'Cosmic symphony' is its restraint. 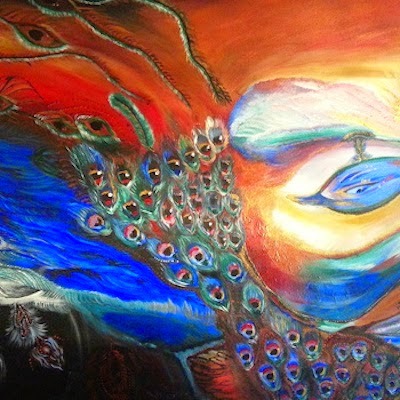 Where the opening symphony 'Open up your eyes' goes all out, 'Cosmic symphony' goes all out in a different way. It simply shows how good and versatile Flying Colors is (also) when playing and singing without finding extreme difficulties in the rhythms etc. 11+ Minutes the band keeps my attention with a song, easy. Flying Colors may be a band who's members have a million other things to do. When they come together they are more than the sum of its parts. This is a real band, even if the members may see this as a side project. Another impressive album is the result. The wild man of rock is no more. Wild because of his voice, wild because of his stage antics. Although from the footage I saw through the years Joe Cocker mainly stood still, his arms and head were moving around the whole time. The Joe Cocker flapping his arms pose is impressive. 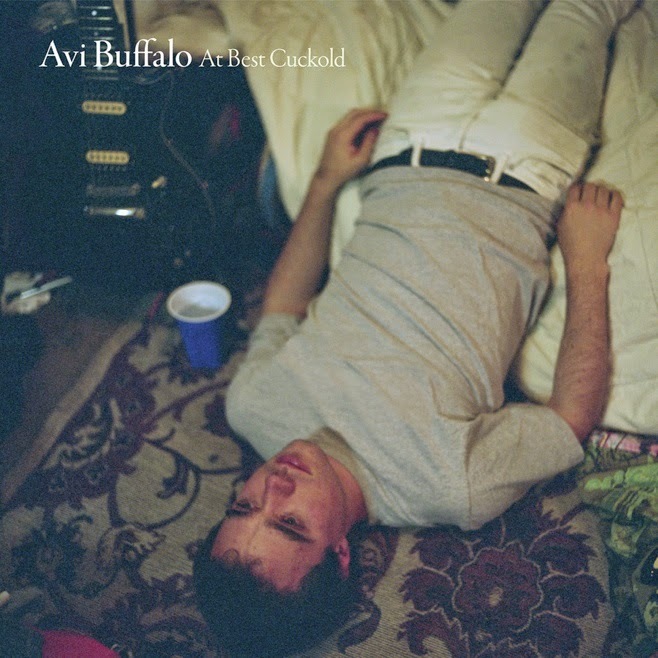 The photo on the cover of this album sort of tells that all. In trance, enraptured by his own music. Forgetting who or where he is. Giving it his all. I'm no fan of Joe Cocker in general. He had some great songs, but in my opinion no great albums. 'Sheffield steel' came closest, but the sound of that is so 80s reggae that I can't really listen to that album any more. The rest I've never really tried. 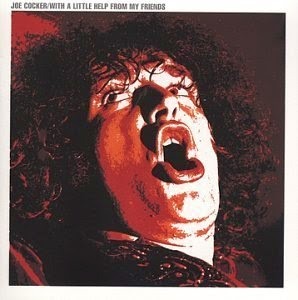 Joe Cocker had a voice to be enjoyed in small doses. The review I wrote on his debut album earlier this year (http://wonomagazine.blogspot.nl/2014/06/with-little-help-from-my-friends-joe.html) tells the story, really. I loved several of his singles. Starting with 'With a little help from my friends' in late 1968. What a sound, what a singer. The 'Woodstock' album took the song to another level again. 'Delta lady', 'Cry me a river', 'High time we went', these soulful, up tempo rocking songs are etched into my mind. After that it was quiet around Cocker. Stories on alcohol abuse is what I mainly remember. 'Sheffield steel' was released in the early 80s, with the production of Sly Dunbar & Robbie Shakespeare. Daring for a singer who dabbed in rock and soul. It gave a push to his career in the 80s which allowed him to keep performing and recording into the new century. In the 80s followed hits like 'Unchain my heart' and 'When the night comes', two other great Joe Cocker singles. What happened after that was beyond my attention. As I wrote I'm not a Joe Cocker fan, I just loved some of his singles. But what a singles they are. They are travelling with me for the rest of my life. Sure, I thought reading Erwin Zijleman's post a while back, what can this album contribute to my memory of the band? Not much, I concluded. And I never was a fan before 'Killer queen' and more specific 'A night at the opera'. I never even bothered to really listen to 'Queen II' and never listened to 'Queen' at all. And then I listened to this 1974 live album anyway and things slowly shifted with the different listen sessions through the weeks. For my birthday in 1976 I bought the then very recent Queen album 'A night at the opera'. Not just because 'Bohemian rhapsody', but because I already knew more than half of the songs from the radio, having taped them. Any Queen album after that was a disappointment. Nothing competes. I still loved many great singles, but when the band started releasing disco or hideous ballads, it went quite off the little path. Around 1978 - 1979 I saw the band live twice in Ahoy in Rotterdam, both great shows. It was not until 1989's 'I want it all', that the band won me back. By then it was almost over, without the world knowing. in hindsight I'll admit that 'Another one bites the dust' and 'I want to break free' are great songs. It just took me about a quarter of a century to recognize that fact. In the past years Queen became a band of the past for me. Songs come by on the radio or in a movie. That's about it. Hence I was not inclined to listen to Live at the rainbow '74. I was wrong. Live at the Rainbow '74 has two albums. One of the beginning of 1974, before the release of 'Sheer heart attack', the band's breakthrough album and one of November from after the release. The difference between the two is definitely discernible, in hindsight. More confidence, a bigger sound, but also more subtle. Queen early 1974 is a hardrock band, not afraid to play a medley of old rock songs. The Queen of late 1974 is more diverse. What both albums show without doubt is how good the band is. With those killer Queen harmonies already totally in place: "AAAAAAHHHHH" at the top of their voices. The dynamics between the three musicians are flawless, making it so easy for Freddy Mercury to sing over. The piano comes in every once in a while as well and fills the sound when necessary.. In fact what I start to realize, is that this is the Queen I like best. The Queen that rocks out and makes use of all its melodic powers. The Queen before Mercury started to explore the U.K's vaudeville of days past. No matter how much fun at times, it's not my kind of music in the end. 'Bring back that Leroy Brown' is certainly a first inkling in that direction. On these Rainbow albums the band is at a milestone in its existence. A high it was not to come off of for quite a while and sort of is still at. Forever. 'Killer queen' is so new the band disguised it in a medley with other "new songs". A medley where Mercury really starts to play piano in. Adding to the sound and variety. So here I am over 40 years after these shows. What I do know, is that the people present must have been happy to have been there. They saw a band break big and still fairly up close. Never again after 1975. Mercury is speaking about "my darlings' with a fairly affected voice. A dead give away in 2014, not so in 1974 it seems. All rock stars in those days were like that: decadent. Setting that observation aside, Live at the Rainbow '74 is a real addition to my Queen discography. 'Son & daughter', ' White queen (as it began)', 'Flick of the wrist', all true discoveries. What fun music can be. Never a dull moment. Blaudzun over the past two and a half years since the release of 'Heavy flowers' has become as big as possible in The Netherlands. Excepting another category of singers that you won't find on this blog selling out arena's and stadiums. 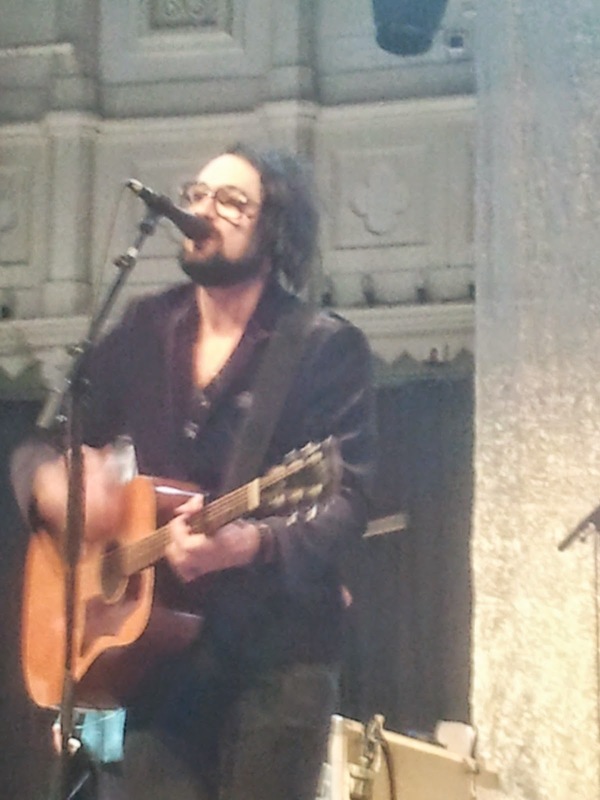 Blaudzun filled Paradiso and twisted it around his finger. Not totally with ease, but twisted us none the same. The audience surrendered itself gladly to a shy man with a not your everyday attire and looks. 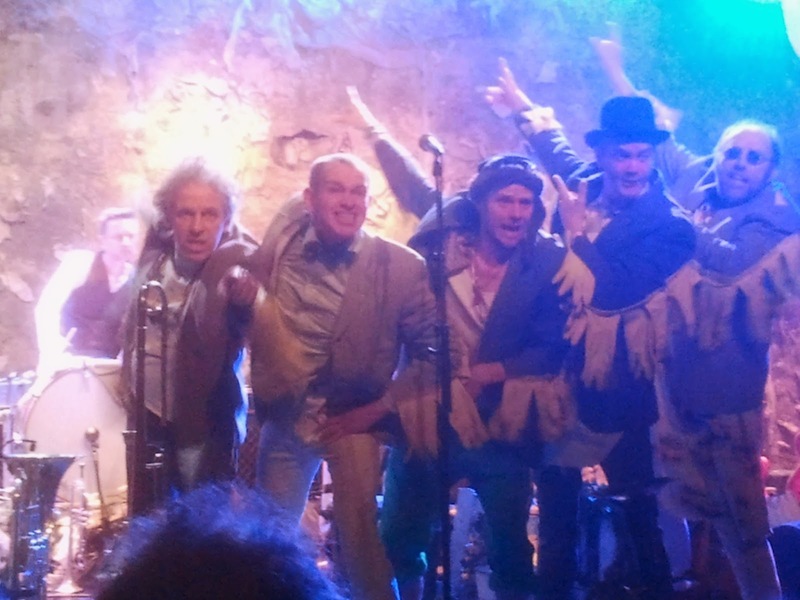 When we entered the former church there was a band on stage called The Indien. In a description I found today the band is compared to Jefferson Airplane, Fleetwood Mac, The Black Keys and Tame Impala. That may be in another universe, but not on this Friday evening in Paradiso. The band failed to make any impression on me. I tend to write something on support acts, as those following this blog know, but I couldn't find a single angle to write about. 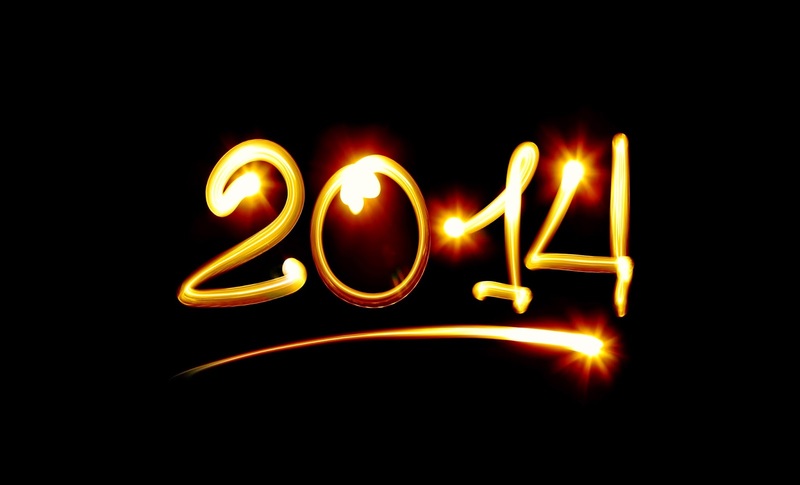 No harmonies to mention, music without noticable dynamics or interesting twists. There was one song that made me prick up my ears, but that was all. A nice girl, at least from a distance, singing nicely but without a destinctive voice from behind an ancient looking keyboard and three nondescript musicians on guitar, bass and drums. The Indien may get there but still has some steps to take. 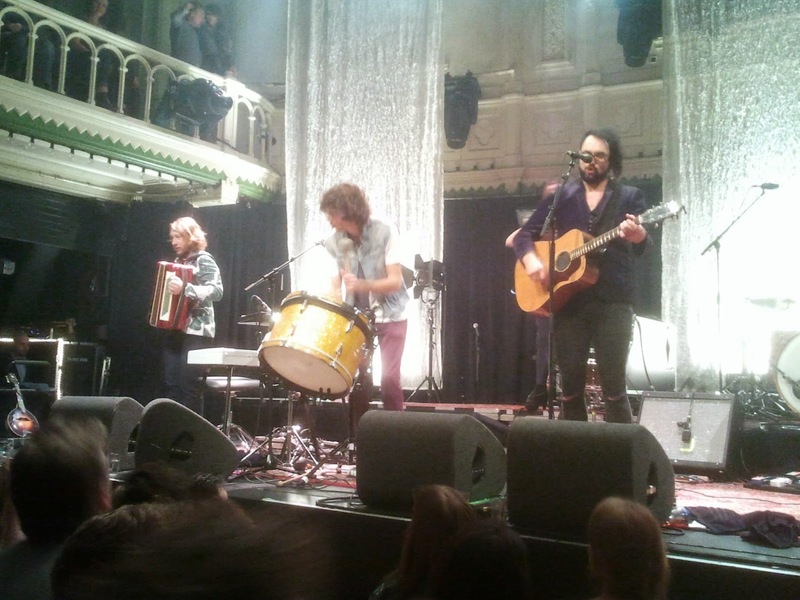 Blaudzun came on stage with an eight piece band extended with two (extra) violinist in some songs. Not so different from Haarlem in 2012. The main difference was, as far as one can recollect such things, that the band cooked up storms every once in a while this time. The dynamics were extreme. 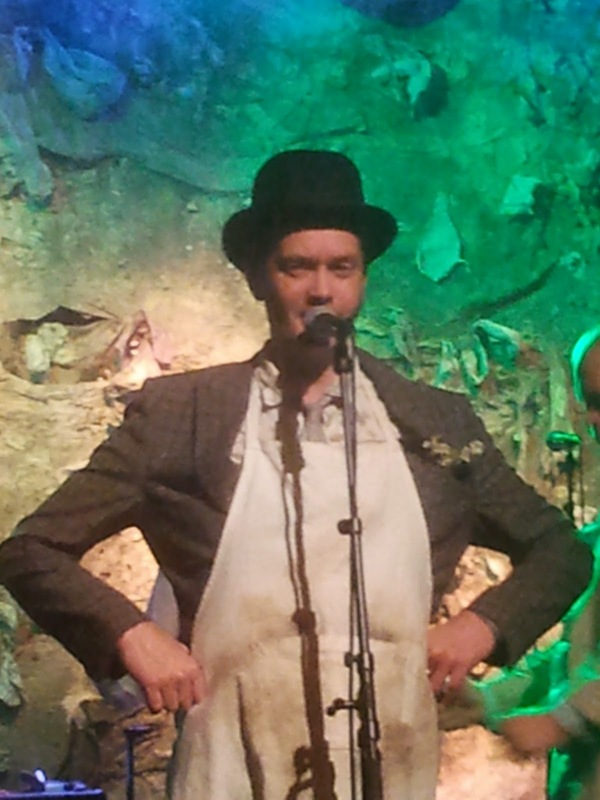 From full force to Johannes Sigmund with a ukulele alone in the middle of the floor among the audience or singing on stage without a microphone. There were enough opportunities to participate as well. The first ever whistling only the end of a song by the crowd and band. Nothing else. It took a while before that one got picked up, but picked up it was none the same. I couldn't help laughing every once in while, as happened on stage also. A whistling audience. An impressive moment by the way. That was not what the audience had come for of course. That was the music. 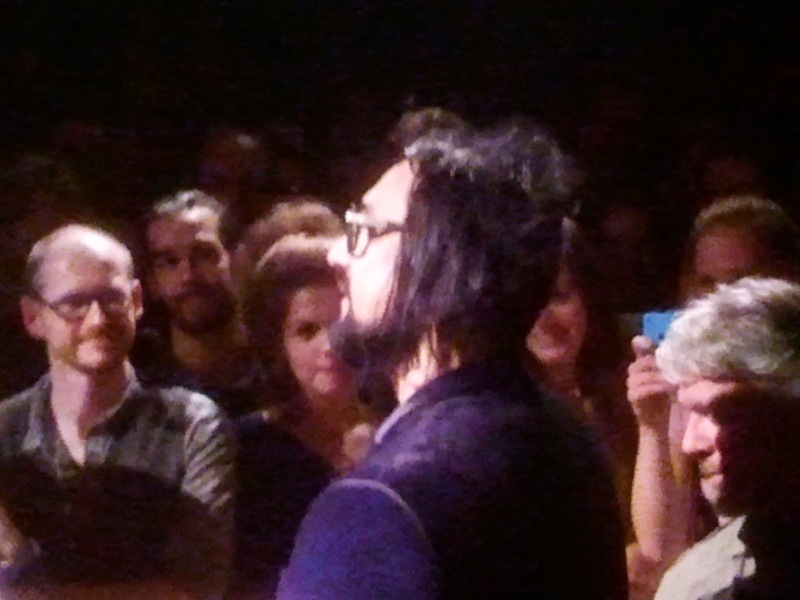 The title of my previous Blaudzun live review was "World get ready, Blaudzun is coming' (http://wonomagazine.blogspot.nl/2012/03/world-get-ready-blaudzun-is-coming.html).This still rings true. The music Blaudzun presents is powerful, different and imaginative. From total emptiness to a wall of sound, it's between these extremes the music of Blaudzun plays itself out. All songs are filled with instruments with distinct roles. All play a motive or sequence of notes or strum chords. Not one steps forward in the form of a solo, each has its own part building a song up to its final incarnation, over which Sigmund sings his songs. Although it's impossible to ever change a first impression, the second one is quite good again. At times the storm from the stage got so loud that I just closed my ears totally. What happened then was great to notice also. The bass appeared, I all of a sudden heard the violin clearly. What mainly disappeared was what I thought was the distorted violin, but must have been the sound the stage hippie produced from behind his mysterious flight case. The enormously loud whine going over all else played. The stage hippie, a big bellied faun dancing like a ballerina over the stage bare footed, was something different to view. The hairdo of Johannes Sigmund falls under that category also. Like somebody has played a prank on him in his sleep, but he hadn't viewed a mirror yet. That doesn't interest me. The quality of the music on offer was superb with many a magical moment that came by. Music that is made with all instruments on hand. Several of the musicians switch instruments or play a simple or more complex piece off percussion when a song calls for it. The setlist was not directly what one would suspect up front. Blaudzun is not afraid to play softer songs towards the end of his set. From up tempo back to a slow and bare song is accepted by the audience. 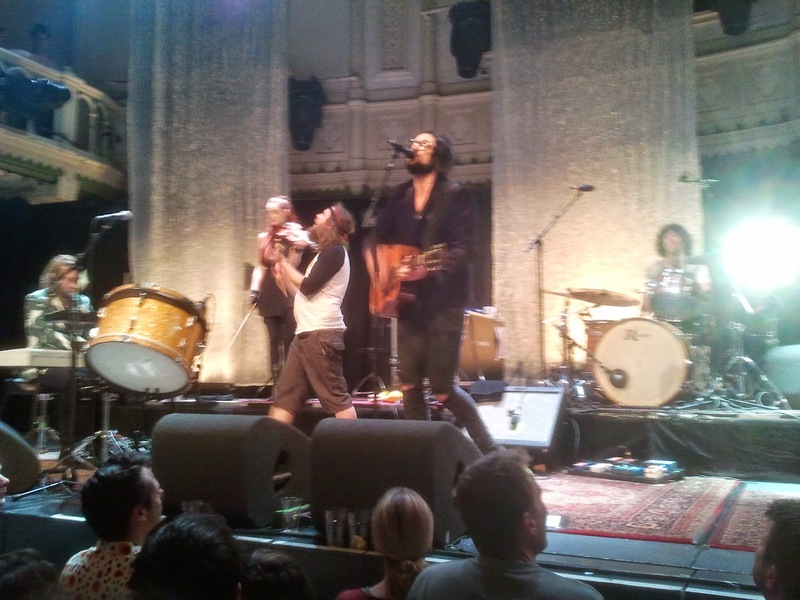 Another sign that Blaudzun has real fans, accepting what is happening on stage and people that are silent when called for. O.k., I think I saw two people nodding of as well, higher up at the first floor railing. One's glass of beer even had to be saved, which woke the guy up. A little Chris Isaak was thown in, that got people singing with 'Wicked game'. 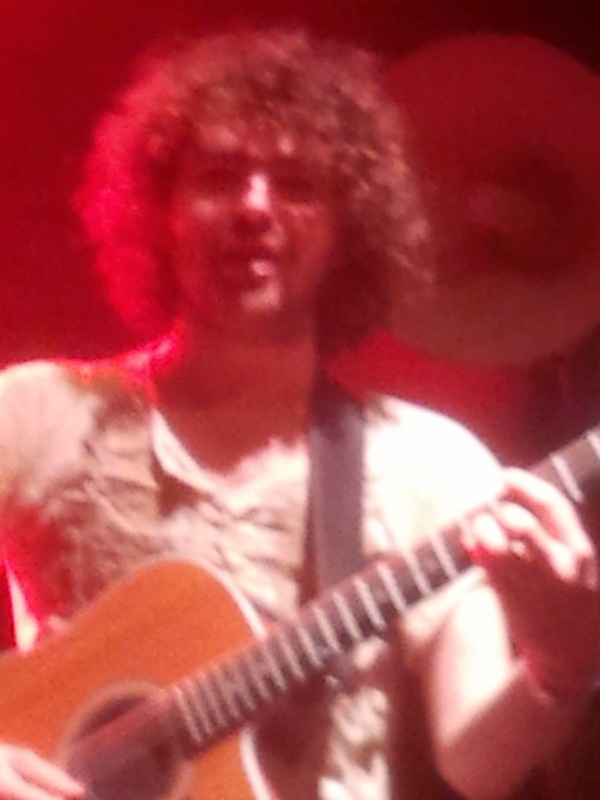 But I also sang along to songs that were not familiar to me, probably from one of the first two albums. One of those songs, "I didn't really know how to play then" circa 2007, when 86 people came to Paradiso to watch Blaudzun. That hadn't changed,. It was the only song of which I thought, mwah. I wouldn't have minded not hearing it, failry boring. But, who knows? Didn't it take the Stones years to change 'Start me up' from a reggae song in to a ferocious rocker? There may still be hope for that one. Blaudzun is good. It's that simple. 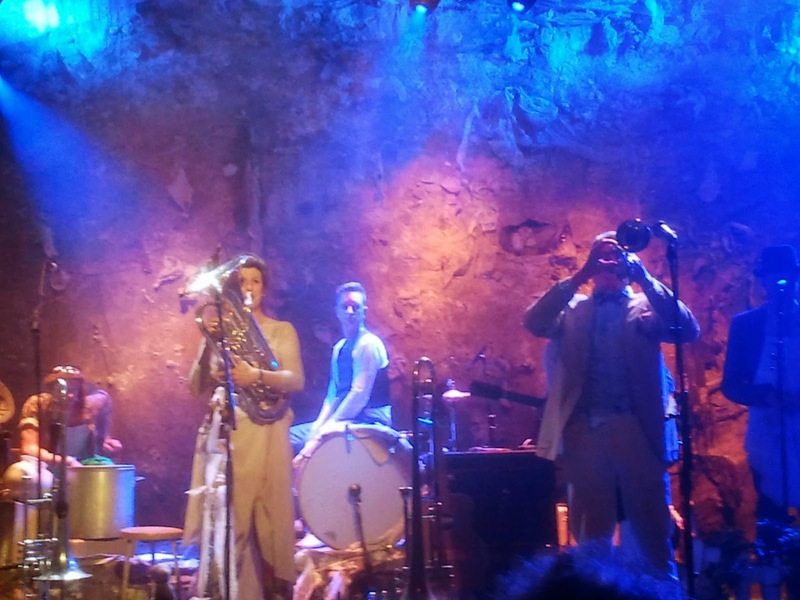 The band impresses with its ability to play very different songs with a lot of dynamics. In one of the encores 'Heavy flowers' finally came by and received a monumental applause as well as played in a monumental version. A highlight of the evening. At heart there's this few violin notes that carry the song and still they are all it takes to go straight to the heart. But what's the story on going electronic? Seems like to me a totally unnecessary sidestep, says the reactionary in me. Blaudzun is at that stage in his career, that it may just set a final step internationally as well. All else may just get in the way of that. Although touring with 8 persons plus personnel is probably impossible to afford if there are no large venues to play abroad. A huge dilemma. Natalie Ramsay is een jonge en nog vrij onbekende Canadese singer-songwriter. 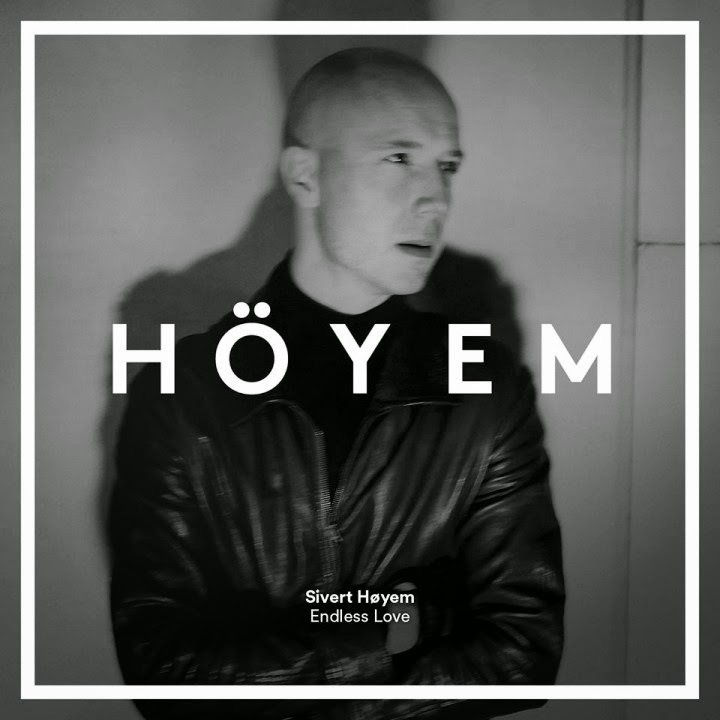 Het is zo’n singer-songwriter voor wie je eigenlijk al sympathie hebt voor je ook maar een noot van haar muziek hebt gehoord. Natalie Ramsay kreeg de muziek ruim 20 jaar geleden met de paplepel ingegoten. Haar vader speelde banjo en nam de jonge Natalie vaak mee naar optredens en bluegrass festivals. Dat Natalie Ramsay zelf muziek wilde gaan maken lag dan ook al op jonge leeftijd vast, maar hiervoor moest ze wel haar verlegenheid overwinnen. Op haar 17e bracht ze haar eerste plaat uit, die op een of andere manier de aandacht wist te trekken op de Filippijnen. Natalie Ramsay wist vanaf dat moment zeker dat ze als muzikant door het leefde wilde, maar constateerde ook dat voor het schrijven van songs met inhoud enige levenservaring onmisbaar is. Die levenservaring deed ze op door alle uithoeken van de VS en Canada te verkennen en uiteindelijk zelfs naar India te reizen, waar ze zich bekwaamde in yoga en het tekenen met henna. Het is bagage die allemaal bijdraagt aan de pure schoonheid van het eerder dit jaar verschenen Fly To Home. Fly To Home werd gemaakt met een aantal bevriende muzikanten en laat een puur en wat traditioneel aandoend geluid horen. Natalie Ramsay maakt ouderwets, of beter gezegd authentiek, klinkende singer-songwriter muziek met vooral invloeden uit de folk. Ze beschikt over een mooie heldere en warme stem en vertolkt hiermee op eigenzinnige wijze haar songs. Bij Natalie Ramsay ben je niet aan het juiste adres voor makkelijk in het gehoor liggende popliedjes, maar liefhebbers van gloedvolle singer-songwriter muziek met inhoud zullen deze Canadese singer-songwriter waarschijnlijk onmiddellijk omarmen. Fly To Home valt op door een mooie, vaak bijzonder stemmige, instrumentatie. Natalie Ramsay speelt zelf akoestische gitaar, piano, banjo, mondharmonica en ukele en heeft hiernaast een gitarist, cellist en (staande) bassist om zich heen verzameld. De vocale harmonieën van Ainsley Borus (helaas maar in een beperkt aantal van de tracks prominent aanwezig) en het virtuoze banjospel van vader Brian maken het mooie en sfeervolle geluid op Fly To Home compleet. Het is een sober en ingetogen geluid dat vaak complex is opgebouwd en bovendien is voorzien van dynamiek. Natalie Ramsay voorziet de mooie, stemmige en wat mij betreft ook bijzondere klanken van vocalen die zijn voorzien van flink wat emotie en beleving. Hierdoor neemt de impact van de songs van Natalie Ramsay nog lange tijd toe en worden haar bijzondere songs uiteindelijk één voor één dierbaar of zelfs onmisbaar. Het aanbod in het genre der vrouwelijke singer-songwriters is momenteel enorm groot, maar singer-songwriters als Natalie Ramsay zijn er niet zoveel. De inmiddels 25-jarige Canadese muzikante heeft immers een plaat afgeleverd die voortborduurt op de rijke tradities van het genre (die vaak beginnen bij landgenote Joni Mitchell), maar ook eigenzinnig durft te zijn. Het is een plaat waarvoor de Engelse uitdrukking ‘it grows on you’ is bedacht, want dit is een plaat die zich snel opdringt en je vervolgens bedwelmt en verovert. Ik werd pas een week geleden voor het eerst getipt over deze plaat (Theo bedankt), maar ben nu al fan van Natalie Ramsay. En dat terwijl ik nog lang niet klaar ben met het ontdekken van al het moois op het zo indrukwekkende Fly To Home, dat wat mij betreft geschaard kan worden onder de ontdekkingen van 2014. Het heeft even geduurd, maar hier is nummer 1 van de 14e jaargang. Geniet ervan, want het was het wachten beslist waard. Eerder jaar kon je De Kift al aantreffen op dit blog. Een kooksessie/repetitie, Oerol, de cd presentatie en de recensie van 'Bidonville'. Nu, een paar maanden later, toog Wo. opnieuw naar De Kift en beschrijft en passant zijn ervaring met de nieuwe Leidse concertzaal: Gebr. de Nobel. De foto's zijn van Wo. Hoe vaak kun je een show zien en het toch leuk blijven vinden? Ik zag 'Bidonville' voor de derde keer dit najaar en dit was de beste van de drie. 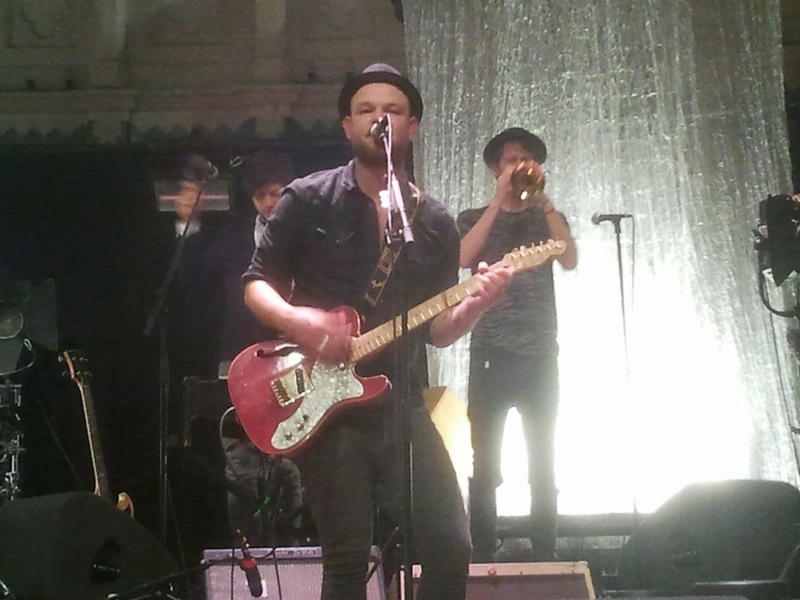 Band en publiek waren in topvorm. Om me heen zag ik enkel mensen met een grote glimlach op hun gezicht staan, bewegend in het ritme van de van De Kift. Hoe raar die ritmes soms ook zijn, de mens vindt zijn weg wel. van Leiden. Na het sluiten van het LVC in het voorjaar van 2012, was er geen grote zaal meer in de stad. Omstreeks die tijd werd er aan de Langegracht richting de Oude Singel e.e.a. gesloopt, daarna een gat gegraven, om vervolgens stukje bij beetje te worden opgebouwd. Uiteindelijk gedecoreerd door een buitenkant van verroest ijzer, als een soort 21e eeuwse vesting van metaal. Waar de meeste activiteiten de afgelopen anderhalf jaar zichtbaar waren, verwachtte ik de ingang, maar die was daar niet te bekennen. Wel De Kift zanger Ferry Heine, die net aan kwam lopen. Die wist te vertellen dat de ingang aan een hele andere steeg zat. En inderdaad. Het gebouw van binnen is net zo massief als van buiten. Veel gemetseld werk is zichtbaar en zijn veel en vooral enorm zware deuren. Zo'n massief stuk deur openmaken vergt enige inspanning. Ik zag dames met hun hele lichaam duwen om er beweging in te krijgen. Met een biertje naar binnen willen lopen, is een hele uitdaging. Buiten de zaal voor iedereen gaan halen onmogelijk. Dat verstevigde mijn indruk van een vesting alleen maar. Goed verzonnen is de vestibule met bar. Als mensen persé willen kletsen, kunnen ze buiten de zaal gaan staan met een biertje. Binnen, er is ook een kleine zaal (voor de Q-Bus na 1 mei 2015? ), heeft de zaal een stevig formaat, met twee galerijen. Het plafond loopt door tot aan het dak is mijn inschatting. Hoog dus. Een groot podium, waar De Kift zijn spullen eens makkelijk op kwijt kon. Maar waar alles om draait, is het geluid. Waar in het LVC Unit Sound alles steevast op loei zette, was er nu een zee aan subtiliteit. Hard, maar prettig en geweldig afgestemd en te horen. Als dit de standaard is, dan heeft Leiden er in alle opzichten een geweldige zaal in ruil voor het LVC gekregen, waar iedere band graag wil gaan spelen en het publiek de band goed kan zien en fantastisch kan horen. Gebr. de Nobel, muziek vesting? Ik ben helemaal voor. De Kift zelf had ook een verrassing. Waar Sanne den Hartogh in september ontbrak en Frank van den Bos zijn rol overnam, was hij nu wel aanwezig. 'Ralphie' schitterde in al zijn overdaad, (misplaatst) zelfvertrouwen en schuwheid. Zijn aanwezigheid, in combinatie met meer routine, gaf ook meer rust op het podium. Er hoefde net iets minder gerend en gevlogen te worden onderling, maar het blijft hard werken om op tijd een instrument, microfoon of attribuut te vinden. 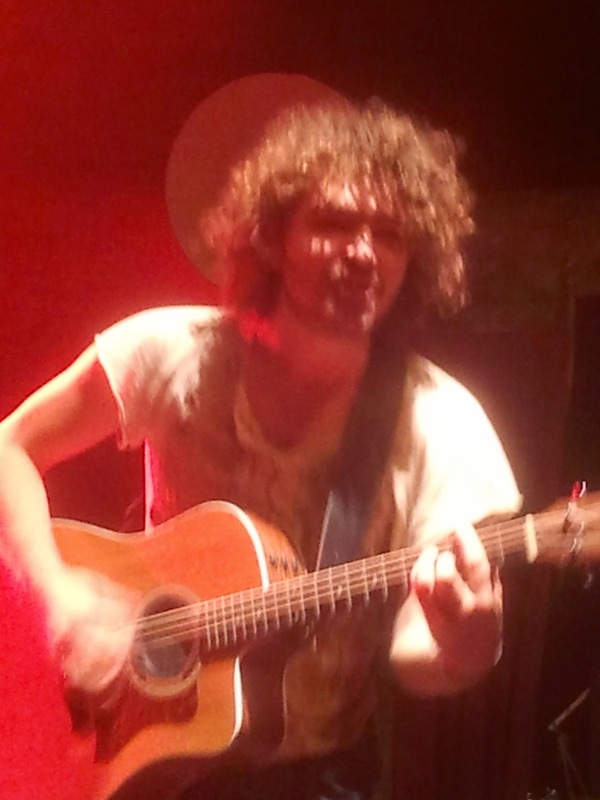 De geblesseerde Pim Heijne die herstelt van een kniebreuk, werd vervangen door gitarist Dolf Planteijdt en vliegende keep Marco Heijne op drums en glaswerk. Wat nog meer opviel met de aanwezigheid van Den Hartogh, was de samenhang tussen eerdere cds van De Kift en 'Bidonville'. 'Ralphie', 'Taxi', 'de engelen' en 'de moeder' van Ralphie vielen beter in hun context. Zeker omdat de engelen in de toegift terug kwamen in 'Oe'. Muzikaal klopte alles. Waar in september kleine foutjes in het geluid zaten, werkte de show volkomen in december. 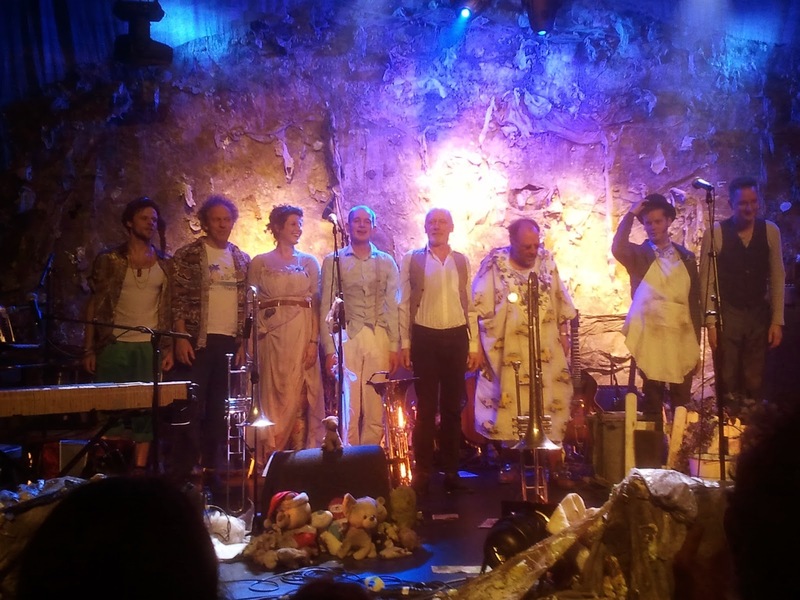 De Kift speelde een fantastische show met bravoure, zelfvertrouwen en een muzikaal vakmanschap waar menig band iets van kan leren. Schitterende harmonieën van zang en koperwerk, het gebruik van elektronica en samples wordt niet geschuwd en de special effects blijven grappig. Teken daarbij de fantastische aankleding van het podium nog aan en de show is compleet. De deelname van Sanne den Hartogh bracht nog een aantal andere verrassingen met zich mee. Een elektrische zaag vol met tamboerijnen of een elektrische gitaar laten piepen en knarsen door een een boormachine bij de elementen aan en uit te zetten. Die kende ik nog niet. Minder goed voor je oren, dat wel. De avond eindigde met het eigen na-feestje van De Kift. Veel uitgebreider dan in september, inclusief 'Oe' met de engelenpakjes weer aan en begeleidend dansje. Dame en heren, het was een prachtige avond en zoals iemand twitterde, met kramp in de kaak van de constante lach op mijn gezicht naar huis? Nou, dat klopte wel. 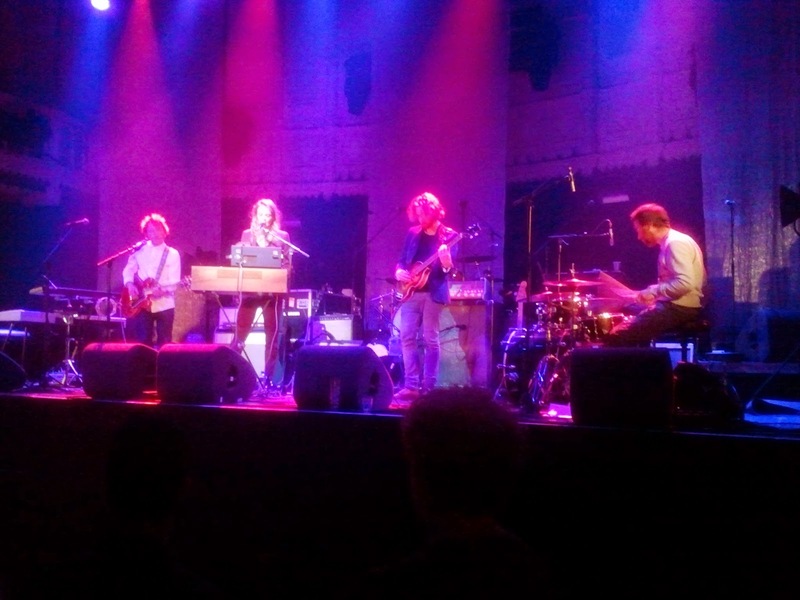 maar nog beter gewoon aan de zaal bij zo'n geweldig mooi en goed optreden van de band.